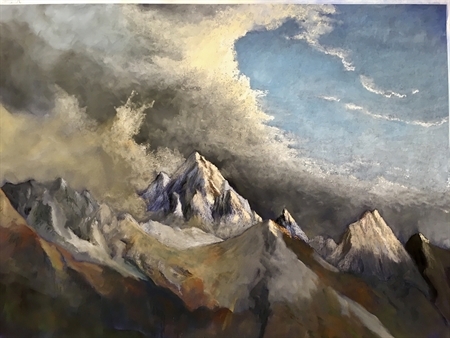 This is one of a series of paintings considering the link between landscape and the sky. Skies allow figurative painters to get very close to the abstract while preserving the ability to load an image with emotion. My wife and I had a wonderful tour of Yunnan, starting at the coast and rising to the Tibetan border. This painting captures the extraordinary landscape of country that used to form part of Tibet before the Chinese take over. These paintings again reflect my ongoing interest in the Romantic and Transcendental movements, but re-expressing these in my own idiom. The tour of Yunnan preceded my last meeting as a member of the China Council of International Cooperation on Environment and Development - an advisory body to the Chinese Premier and State Council. I joined it when Wen Ji Bao was Premier (the first and likely only Australian, I was nominated by Alexander Downer) and served on it for ten years. Unfortunately I contracted a virus and became very ill during the meeting - I was determined to make it to my meeting with the Vice-Premier, but was taken straight after it to a Beijing hospital where I stayed for the next two and a half weeks. A sad way to end 50 years of representing Australia one way or another.